Kindle your imagination and shift your perspective with our charming Sparkboxes. 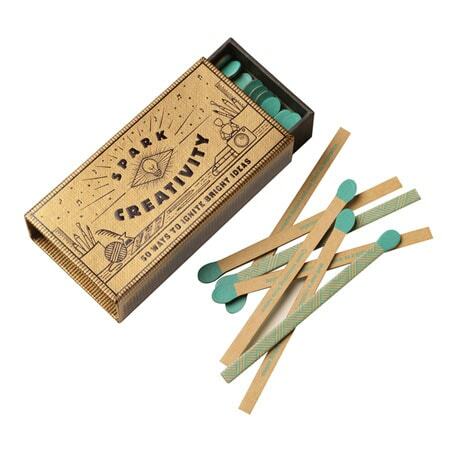 Each 2½"x5" box resembles a matchbox; slide it open to find fifty cardboard "matches" inside, each with a different prompt. Within Spark Creativity you'll find suggestions such as "What can you make when you imagine there is no way to fail?," and Spark Happiness helps you harness the joy in each day with proposals like "Start a new tradition with your friends or family." Each clever little kit inspires, motivates, stimulates, and encourages, whether you're in a slump or simply need a little extra nudge in the right direction.